If you look closely at this beady-eyed brood, they are not as they seem. Octopi are considered to be intelligent creatures, so for some their consumption as food is controversial. As our global climate changes, the fear of hunting them into extinction is quite real. It makes it ever more difficult that baby octopi are particularly delicious. A popular Asian seafood dish is stir-fried baby octopus (ojinguh bokkeum), marinated in Korean chili paste (gochuchang) and garlic overnight. It’s a dish that can serve to make a guilty conscience grow heavier. A clever kitchen gadget gone for good? 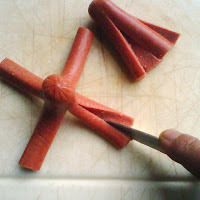 I found a solution to the matter with a clever kitchen gadget known as the OctoDog Frankfurter Converter. But alas, I’ve since found that this handy kitchen gadget is no longer in production—yet another victim has fallen to extinction in this unstable economy. I was advised to bid on eBay if I really wanted one but the competition seems fierce. 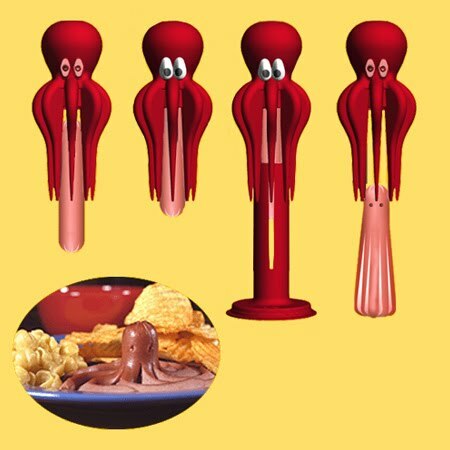 I couldn’t bare to see the OctoDog go the way of the Dodo and Hostess Brands Snowballs, so instead I came up with my own home-spun solution. First I cut the dog in half to make two pieces. I plunge a knife about an inch from the end and make lengthwise slice towards the cut end, then roll it 90° over make another lengthwise slice to create four legs. I stand the dog upwards with all four legs evenly splayed out, then cut each leg lengthwise again to make a total of eight legs. And there we have it, a baby Not-opus.